Ratings of the faith that Russian citizens have in President Dmitri Medvedev and Prime Minister Vladimir Putin have reached historical lows, Kasparov.ru reports. 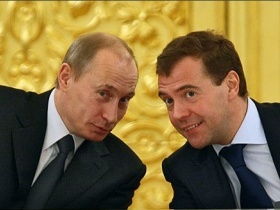 According to the results of a national poll conducted by the Public Opinion Foundation (FOM), Medvedev’s faith rating has fallen from his all-time high of 62 percent in January 2010 to 46 percent in April 2011. The number of those polled who have faith in Putin also diminished over that period of time – from 69 to 53 percent. The prime minister’s highest recorded rating, according to FOM, was 71 percent in the third quarter of 2009. Similarly, the rating for United Russia, the prime minister’s party that holds a near political monopoly over Russia’s political space, fell to 44 percent – the lowest figure in two years. At the same time, the level of distrust towards the party rose from 29 percent in January to 38 percent in April. Opinions towards other political parties included in the survey – A Just Russia, the Liberal Democratic Party of Russia, and the Communist Party – remained largely unchanged, although ratings for the Communist Party were up slightly overall. According to another recent survey done by the Levada Center, United Russia’s rating reached a two-year low in April. When asked what party those surveyed would vote for if elections were this coming Sunday, only 39 percent answered with United Russia. The rating for the Communist Party, however, rose from 12 to 18 percent over that period of time. As Kasparov.ru pointed out, the Levada Center already noted a marked drop in the popularity of the Putin-Medvedev tandem and ruling party back in January. At the time, United Russia members dismissed the statistics as being influenced by seasonal factors – “a political hangover” – following the New Year’s holidays.